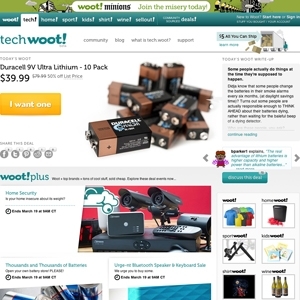 Anyone familiar with Woot already knows that their main site offers many deals on gadgets, but as Woot puts it: Tech.Woot is more like a "cyber-pedestal" for the tech deals they love. So if you love gadgets, this place was meant for you. Tech.woot.com currently ranks #12 amongst sites offering online deals -- DX Offers ranks #11. In the Computers and Electronics category, Tech.Woot ranks at #2 -- Newegg ranks #1. Tech.Woot is considered the most popular deal a day site, ranking in at #1. As for the 2nd most popular site, it's Giveaway of the Day. Offers specials on refurbished electronics.